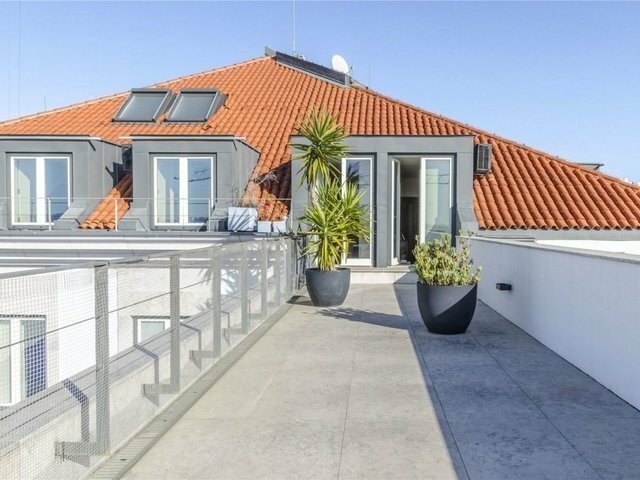 Exceptional 3 bedroom apartment in the luxurious condominium of Paço do Duque in Chiado. The property has a terrace which offers spectacular panoramic views across the city, and of the Tagus River. It comprises a hallway, a living room with window onto the terrace, a dining room, a kitchen, 1 en suite bedroom, with a window to the terrace, 2 further bedrooms and 2 bathrooms. The property has central heating, air conditioning in the living room and suite, and electric blinds. It's a neighborhood that flashes back to the late 19th and early 20th centuries, the "Belle Époque" when writers such as Fernando Pessoa and Eça de Queiroz used to write at the now-historic cafés.